MONTREAL, December 7, 2018 – Logiag, an agro-environmental consulting business, and Effigis Geo-Solutions (Effigis), a Quebec-based technology innovation company in geospatial solutions, announced today that they are combining their expertise so Logiag can offer its customers environmental management support plans that include optimizing nitrogen management. 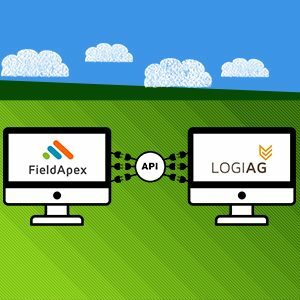 Under the terms of the agreement between the two companies, the FieldApex application and the Record+ software will be interconnected for subscribers to access their nitrogen prescription directly from the software. Prescriptions will first target corn, and eventually potatoes. In addition, subscribers may view FieldApex’s value-added products free of charge, such as crop health maps, which help identifying issues in the fields. “Managing nitrogen is essential to support farmers in the sound environmental management of their farms,” Jacques Nault, Logiag’s Vice President, Agronomy, explained. “It made sense to integrate FieldApex with Record+, since the platform recommends nitrogen rates based on a long-proven algorithm”, he added. According to a recent survey of FieldApex users in Quebec and Ontario, more than 90% are satisfied with the rates that were prescribed for the 2018 season. “It’s a great success,” said Nicos Keable-Vézina, agronomist and director, precision agriculture, at Effigis. Considering the dry weather this season, the rates recommended by FieldApex were much lower than standard rates, resulting in significantly lower production costs for farm producers. “We are looking forward to receiving all 2018 yield data from fields where FieldApex prescriptions were used, to compare them with the economically optimal rates once they become available,” he continued. The benefits of the partnership are clear for both companies. FieldApex nitrogen prescriptions will integrate with Record+ in a global fertilization approach, while interconnecting the platforms will facilitate the development of new precision farming tools that leverage crop health maps and artificial intelligence algorithms. Jacques Nault et Nicos Keable-Vézina are available for interview upon request.